Home Entertainment Zayn Malik Gets Back into the Studio in New York City! Zayn Malik Gets Back into the Studio in New York City! Zayn Malik is working on more new music! 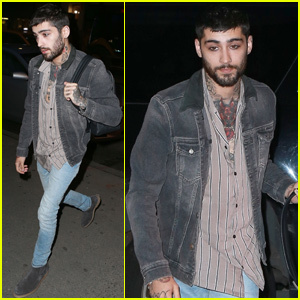 The 25-year-old Mind of Mine singer was spotted heading into Electric Lady Studios on Tuesday (October 2) in New York City. Zayn showed his style in a striped button down paired with a black denim jacket and jeans as he headed into the iconic recording space. The day before, he was also spotted out and about in the Big Apple! Zayn also recently starred in a fashion campaign for The Kooples and designed two limited-edition backpacks for their new menswear collection! See Which Stars Congratulated Nick Jonas & Priyanka Chopra on Their Wedding!